Can the new Premier Rio multi-jet take on Renault Duster? Car manufacturers have sensed a strong demand for compact diesel SUVs below Rs. 10 lakh. There are at least three compact SUV launches scheduled over the next few months, with many having been showcased at the Auto Expo 2012 in Delhi. Premier Auto, the little known Indian car maker which sells the Rio compact SUV only in BSIII compliant cities, is planning to go mainstream across metros where BSIV norms are in place by offering the Rio with a Fiat-sourced 1.3-litre Multijet diesel engine. This is the same engine that’s in the Maruti Swift, Fiat Punto and Tata Vista. The Rio is actually the first compact SUV on the market, but most of the limelight has been on the Ford EcoSport and Renault Duster. Renault is gearing up to launch the Duster in the next few weeks. Does the Rio stand a chance? The Duster is expected to come powered by an 85 Bhp, 1.5-litre diesel motor while the Rio will be powered by a 74 Bhp, 1.3-litre diesel motor. The Duster will also have a 105-bhp diesel option. The Duster wins hands down when it comes to power specifications, but the Rio weighs less than the Duster and hence, overall performance won’t be compromised too much. The Duster is a badge engineered version of the Dacia Duster that sells in central Asia, and is a proven good-handling machine with solid built. 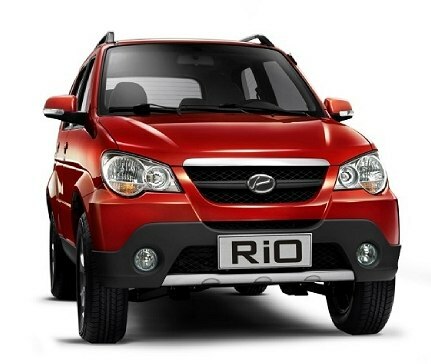 The Rio is originally the Zoyte from China which has seen decent acceptance as an “urban” lifestyle SUV. Even though the Rio has been in India for over two years, it is not very popular. Dimensionally, the Duster is slightly bigger than the Rio because, the Duster measures 4,300 mm in length while the Rio measures 3,970 mm only. The Duster will likely have more legroom for rear seat passengers and more luggage space than that of the Rio. The Rio is cramped for tall passengers both at the front and the rear. On the other hand, the Duster will likely fit in tall passengers without causing them much discomfort. Overall, the Duster seems a promising SUV with comfortable and spacious cabin for five passengers unlike the Rio which has just about enough interior space. The Duster has macho looks with its high ground clearance, thick wheel arches and sturdy road stance. The Rio looks a bit skinny and despite the facelift changes, continues to wear an old school design. The only aspect that makes the Rio look a bit sporty is the tail-mounted spare wheel. Interiors of the Duster can be expected to be more upmarket than the basic interiors of the Rio. 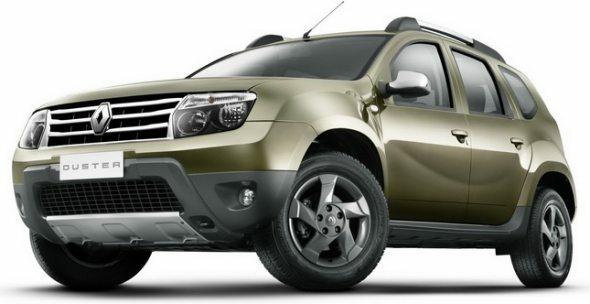 Besides, plastic quality, fit and finish are likely to be better in the Duster, going by the Dacia Duster’s build. Pricing will play a major role in determining the success of both the Duster and the Rio multi-jet diesel. The Rio may have an edge because, the outgoing BSIII compliant models are priced competitively in the range of Rs. 5 lakh – Rs. 6.59 lakh. Hence, the Rio powered by the Fiat diesel engine may be priced at about Rs. 6 lakh. We expect the Duster to be priced in the range of Rs. 8 lakh – Rs. 10 lakh. With regard to mileage, the Rio may have a slight edge over the Duster, as the 1.3-litre multi-jet engine is known for its good fuel efficiency. In terms of sheer value for money and fuel economy, the Rio may have an edge. The Duster seems to have a clear advantage over the Rio in many areas such as performance, handling, looks, space and comfort. However, the Rio does have its trump card, the proven Multijet diesel engine which has found its way under the hood of many cars such as the Swift, Dzire, SX4, Ertiga, Punto, Vista, Manza and Linea. Besides, the Rio’s pricing and mileage also seem to be in its favor. Overall, the Rio BSIV diesel may not pose a strong threat to the upcoming Renault Duster, but will find its own niche.